Information and advice on using transport, for individuals affected by a neurological problem. Getting around can be challenging for anyone at times, but arranging and dealing with transport can become more of a problem when you have, or are recovering from, a neurological problem or condition. This article aims to provide information and advice for people affected by a neurological problem who may have concerns or face difficulties with transport. If you drive, you may be keen to get back to your normal routine as soon as possible after a brain injury or illness. However, your recovery can take time and things may not be the same as they were for a while. It is important to discuss returning to driving with your doctor or specialist before you get back in to the driving seat. Many people find that they become more tired easily, or lose concentration quicker after sustaining brain trauma. Fatigue and memory problems are also common symptoms of other neurological conditions and these can affect your ability to drive. 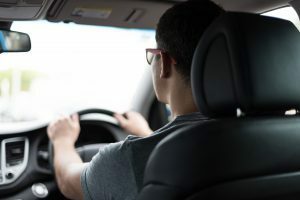 When you begin driving again, it may be helpful to drive with a friend or relative at first. Even if you think you feel well enough to drive, you may still need some extra help. Always check weather ahead of your journey and don't drive in unsafe conditions such as rain or snow. It is a legal requirement to contact the DVLA if you suffer from a condition that may affect your driving. Notifiable conditions include any neurological condition, such as epilepsy or stroke, or any problems that may affect your vision. More information can be found here. If you don’t have a driving licence, or you have had your license suspended, you may have to rely on public transport. Depending on your situation, you may be eligible to apply for a Freedom Pass if you live in Greater London. You can check your eligibility here and the application form can be found here. For those outside of London, you may be able to obtain a disabled persons travelcard for use on buses and more information can be found here. Don’t be afraid to ask for assistance – in advance or on the day. Transport staff are often trained to help customers with mobility problems and anxiety, or who feel unwell. Many train stations now have step-free access, but it can be a good idea to check whether the stations you are visiting offer this before you travel. You can find all stations with this service on the National Rail website or on the Disabled Persons Railcard website. If you live in London, or visit regularly, some London underground stations are now also step-free and the TFL website has a section on transport accessibility and getting around London to help plan your journey. Most trains and carriages can accommodate wheelchairs; however there are a limited number of spaces available to wheelchair users on each train. Booking your tickets in advance can help to ensure a space is available if needed. If you have specific concerns or worries about a journey that is coming up, you might wish to contact the train company you are travelling with in advance, so that they can help advise you on how to make your journey as easy as possible. National Rail have a section here on their website about the assistance you can expect from all train companies. If you plan to travel by bus or coach, it is best to speak with the bus or coach company to check what facilities are available to be sure that they match your needs. The availability of bathroom facilities and how often it stops may be some of the questions you wish to ask. Some coaches and buses are equipped with platforms that lower in order to make it easier for people to get on and off if they have walking difficulties or are using a wheelchair. As with trains, wheelchair spaces are limited and booking in advance is advised where possible. It is always best to speak with your doctor or specialist before you plan to travel somewhere by air. It may be that there are important things to consider in relation to your treatment, recovery, or condition, which may affect your travel plans or needs. Before you are scheduled to fly, it can be a good idea to speak to the airline and airport staff in advance to discuss any assistance you think you may require. They will be able to let you know what facilities are available at the airports you are travelling to and from, and how much time you should allow for checking in and travelling through the airport itself. It can be useful to allow extra time to go through security, especially if you are travelling at a busy time of day. 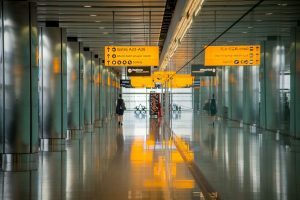 Security checks for someone with a neurological condition or disability are the same as for anyone else, but they may take a little more time depending on your situation. If you will need assistance with your baggage or travelling around the airport, then this ideally should be arranged ahead of time so as to avoid delays and unnecessary stress on the day. If you are travelling, especially abroad, it is important to make sure you have appropriate and up-to-date travel insurance. Cycling with a neurological condition or after a brain injury may sound like it could be a challenge, but with some care and consideration it can be a great way to stay in shape and get some confidence back. As with any kind of exercise, it is important to speak with your doctor or specialist about starting cycling and they may have some suggestions to help you improve your fitness, balance, or co-ordination before you begin. You may be interested in John Nicholson’s inspirational story about getting back on a bike after a subarachnoid haemorrhage here on our own website). The Get Cycling website features some very helpful tips on buying a bike that is tailored to you and your needs if you are unable to ride a standard road bike with your condition. They also feature some case stories about people who have had strokes and have gotten back into cycling. Some local councils have cycling schemes that may offer support for cyclists who are registered disabled and for those who just want to regain confidence. Please contact your local council for more information. Walking can be an enjoyable way to get around, and is a simple and easy way to stay active and improve your health. 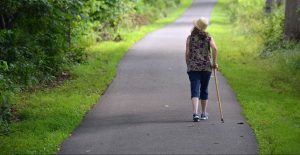 However, following an injury or illness, or for people with long term neurological conditions, walking longer distances can be difficult and sometimes very tiring. It may be that you cannot avoid walking due to limitations with local transport, or that you are not yet able to return to driving. If you are unsteady on your feet, afraid of falling, or cannot walk for very long or very far, then this can be daunting at first. With the right support and approach however, you can ensure that walking places is safe and enjoyable. Walking with a friend or relative can ensure someone is nearby in case you feel unwell and need to stop for a moment, and they can assist you in carrying shopping or luggage should you get weary. If you are walking on your own, carrying a mobile phone is a good idea in case you need to get in contact with someone whilst you are out. If you do not have a mobile phone, then letting someone know when you are leaving, where you are going, and when you should be returning, can help you to feel more confident and ensure your safety. Depending on the distance you need to walk, you may want to consider places to rest or stop for a break. You may want to walk shorter distances at first and build up slowly. Staying hydrated by drinking water can be important on longer walks. Make sure you wear comfortable shoes and clothing. This may seem obvious, but it is important to adjust to the weather and to make sure you have good, sturdy shoes on, regardless of how far you walk.